When your definition of high performance means both speed and reliability, the 3D MLC 7mm SATA III Internal 2.5-inch SSD is the primary drive upgrade solution for every machine from an ultra-thin laptop to a desktop workhorse. With this SSD engineered for long-term real-world use, you'll experience extreme speeds, greater data reliability and access times faster than a conventional HDD. 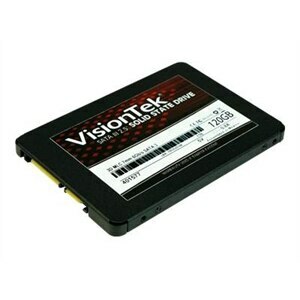 It's SATA 6G ready, but backwards compatible with SATA 3G and 1.5G machines too. As it features Silicon Motion Controller and tier one high-performance NAND flash, the 3D MLC 7mm 2.5" SSD is designed to deliver top speeds with the files you utilize daily: videos, mp3s, graphics files, and zip files. While these files are compressed, the SSD controller doesn't slow down while processing them. Whether you have a rugged full-sized laptop or travel light with an Ultrabook, the SSD will fit your 2.5"-compatible machine. Its 2.5" 7mm low profile form factor is ideal for modern computer designs, while the included adapter makes it fit perfectly in machines that require a 9.5mm-high drive. Temperature sensor, TRIM support, Secure Erase function, Wear Leveling Support, Error Correction Code (ECC), Bad Block Management, Silicon Motion controller, S.M.A.R.T.